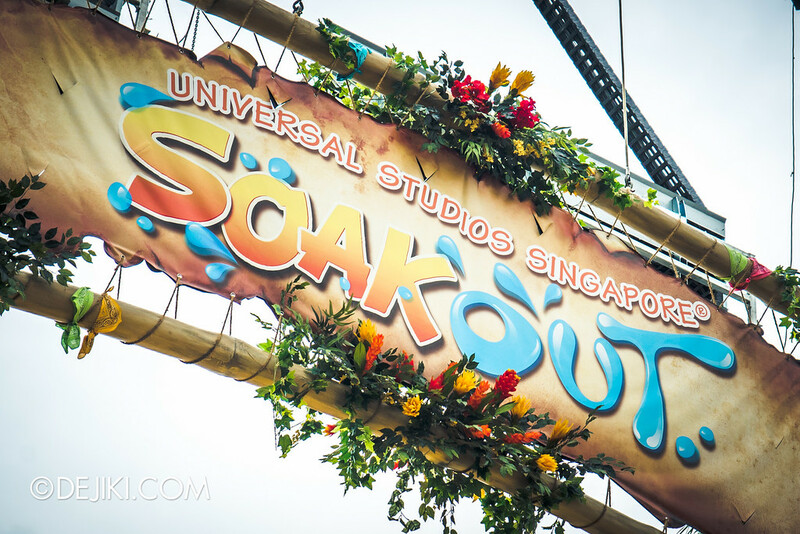 Check out the splash-tacular Soak Out Water Party at Universal Studios Singapore! 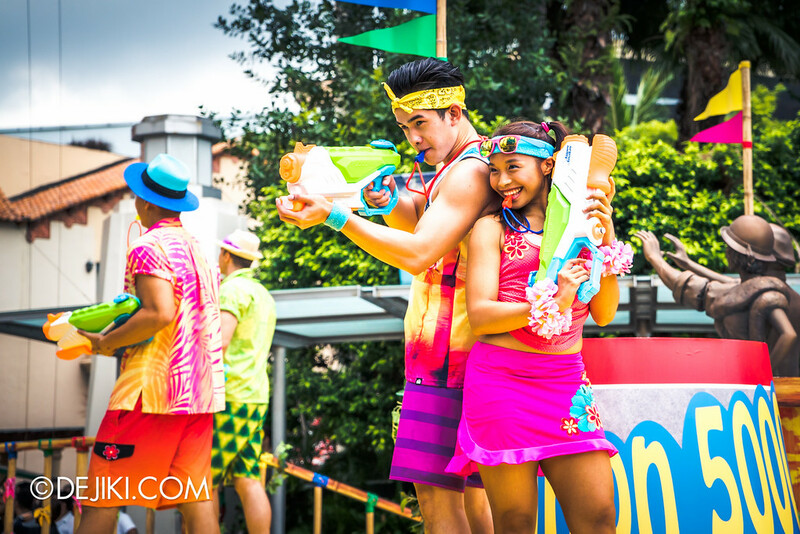 Soak Out Water Party is the park’s new summer season show, performed every day at 3:00pm (or 5:30pm on Saturdays), at the Hollywood Lagoon Stage. 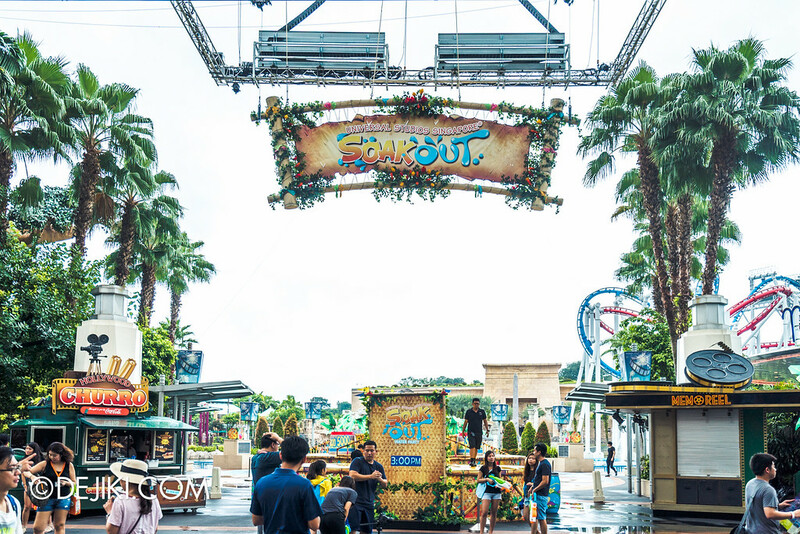 Unlike past shows in the same area, Soak Out’s stage extends towards the park’s lagoon, allowing more guests to be part of the experience, up-close. The party is a 20-minute long show. And it doesn’t mean that everyone is going to get wet the moment they arrive. 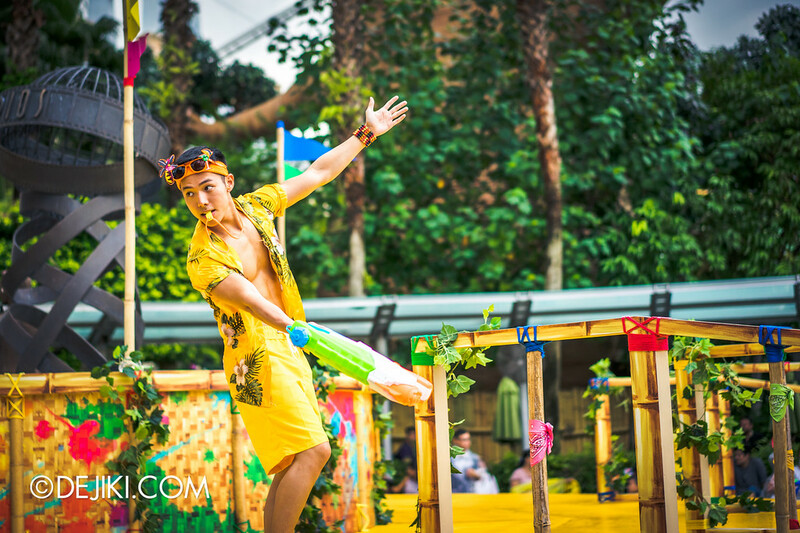 In fact, water play from the performance starts only after a certain point. 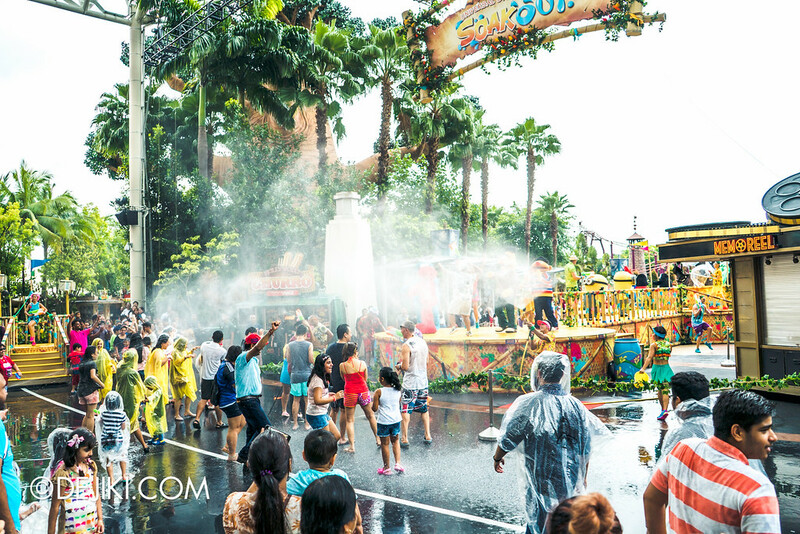 Only those in the Lagoon Stage front section will get wet before that (due to other guests playing around, and the park crew participating in friendly water fights too). 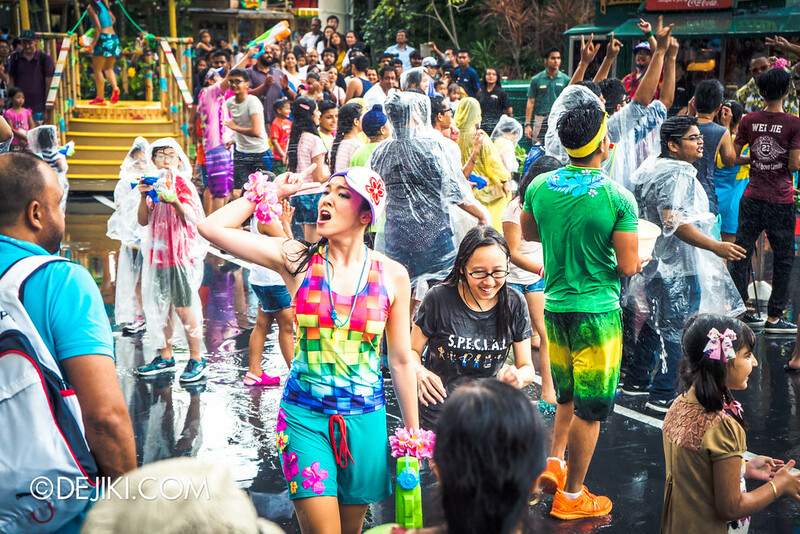 Despite some park regulars’ worries that this is going to be ‘Songkran USS’, Soak Out is quite a tame water event – you won’t get completely drenched unless you are right in front and asked for water buckets to be tossed at you. Apart from the incredible finale, the use of water seemed prudent. 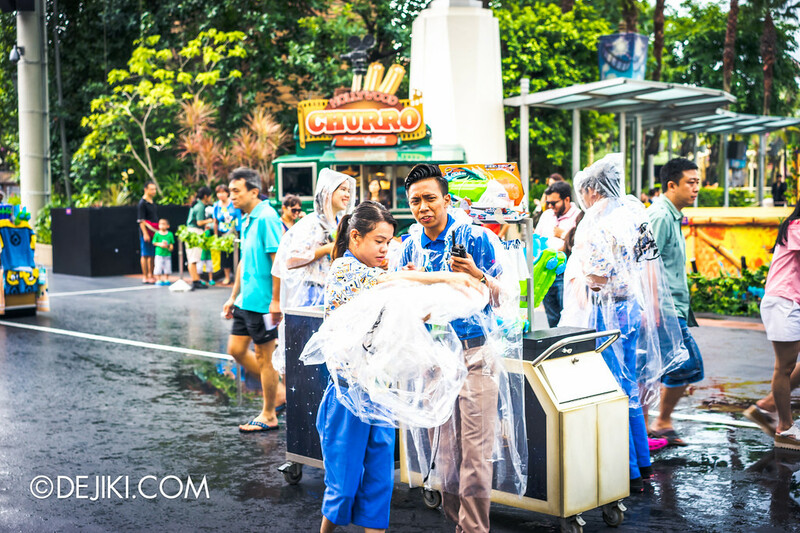 Even some ‘refill water’ for water guns came recycled from melted ice from drink pushcarts – a wise move given that there are some droughts around the region. Nope, no one gets wet until everyone’s here! 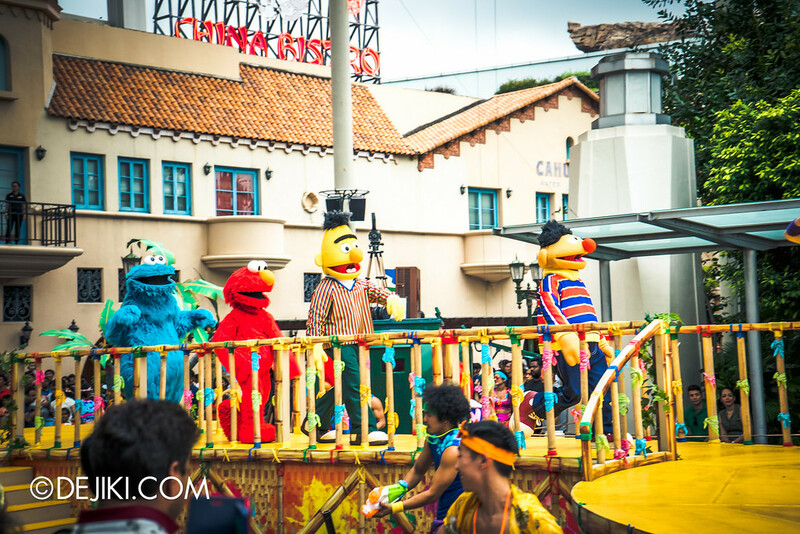 The park’s meet-and-greet characters, such as The Woodpeckers, Minions, Penguins (from Madagascar) and Sesame Street Gang, join the show’s dancers in the party. 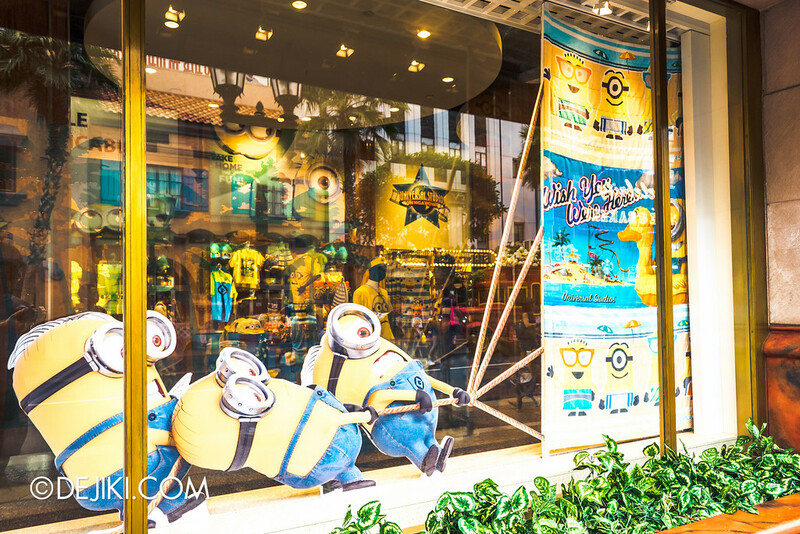 The characters are in their usual looks, which looked rather odd – perhaps it was difficult to get past the licensing hurdles for these characters. I’m more surprised that the park is willing to get these fur costumes wet (and cleaning them afterwards), perhaps that’s why the show is only performed once a day. All in all, it’s about 20 minutes of dancing and getting water everywhere. 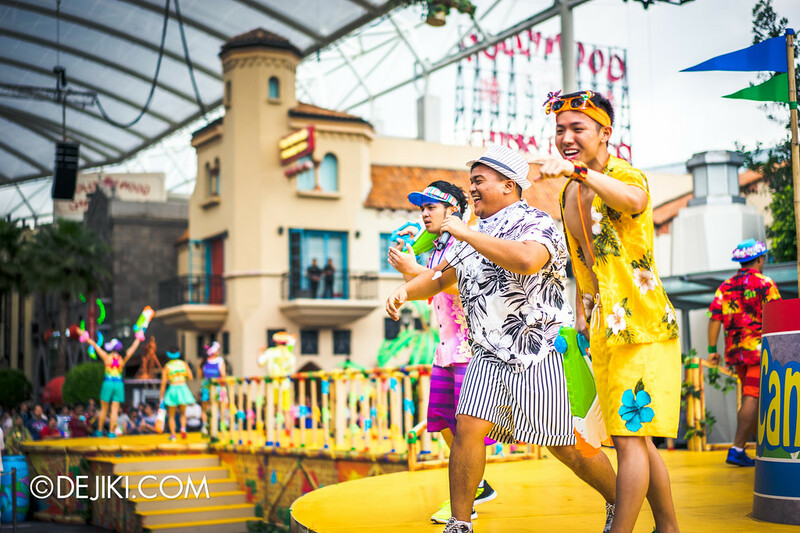 The music selection is filled with typical fun beach party music, and the cast looks like they were enjoying it as well. *- Please comment if you know the other tracks (spaces marked **) or the correct covers/ remixes. 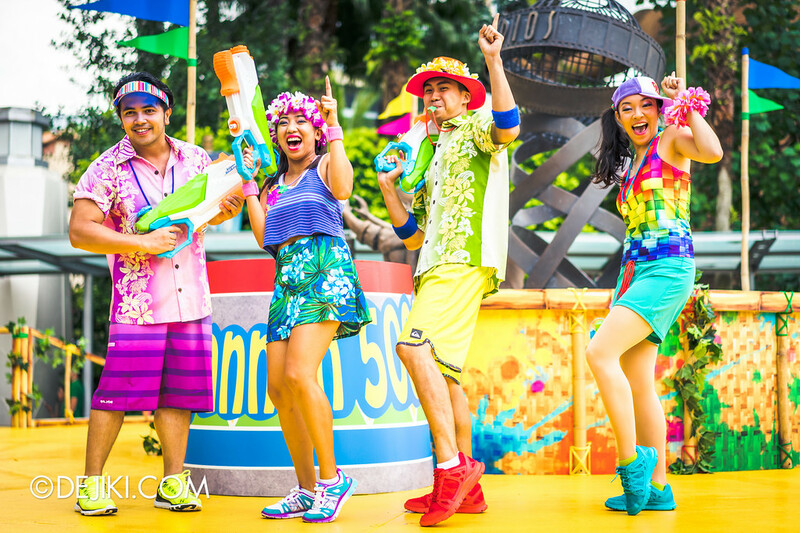 Though such ‘summer splash’ shows common worldwide, it’s a good attempt by USS to introduce something new. 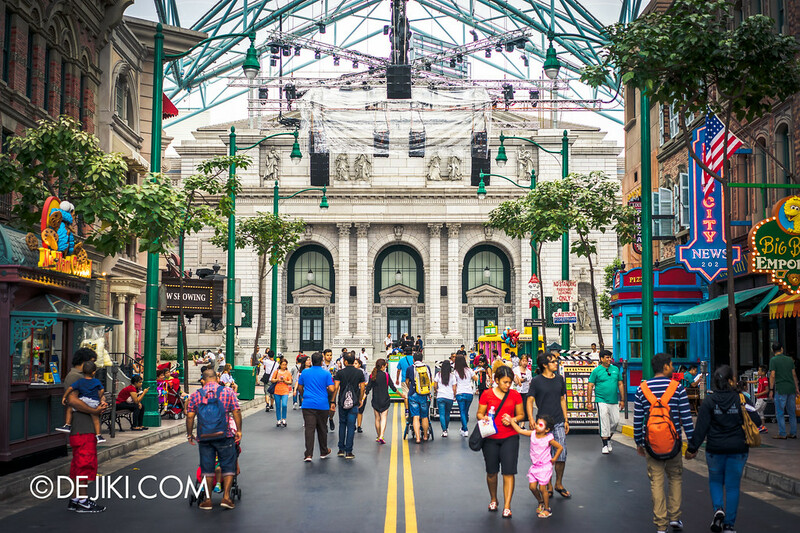 After all, there’s no space for new rides anymore without expanding or removing existing attractions. 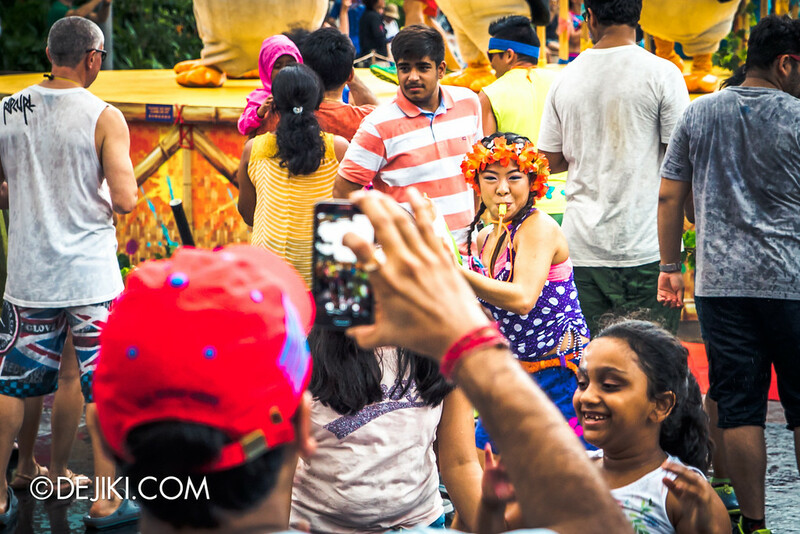 Events will be the park’s way forward. 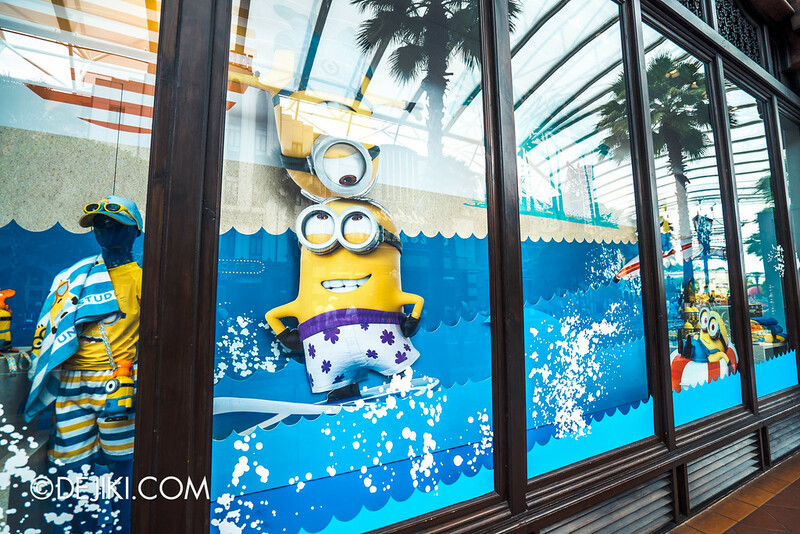 Hmm, how about updating attractions? Transformers with Real 4K and Infitec 3D? Revenge of the Mummy with animated projections? 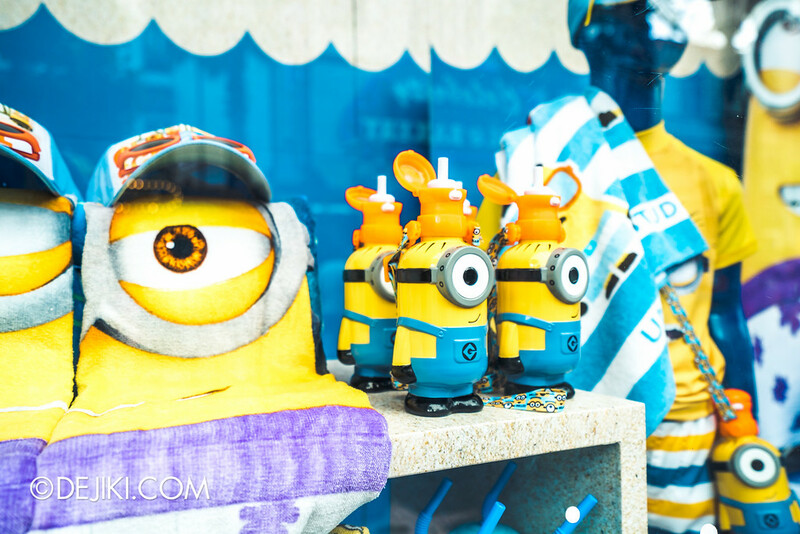 But having it all once a day – just right, or too little? 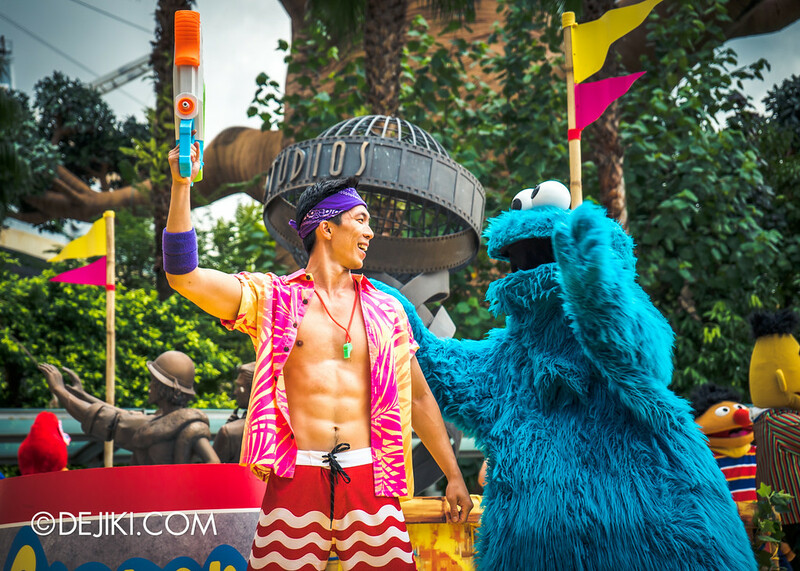 Universal Studios Japan has 2-3 shows of their ‘Water Party’ in a day. 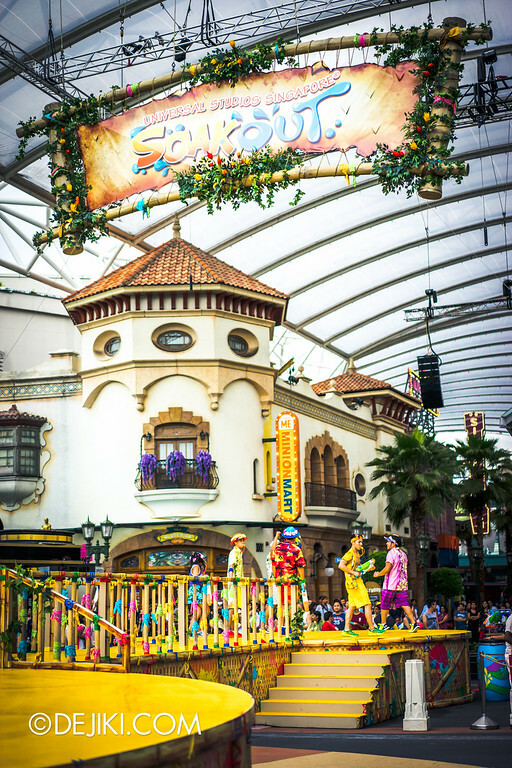 Perhaps this might be tweaked further down Soak Out’s season, which goes on till 10 August. 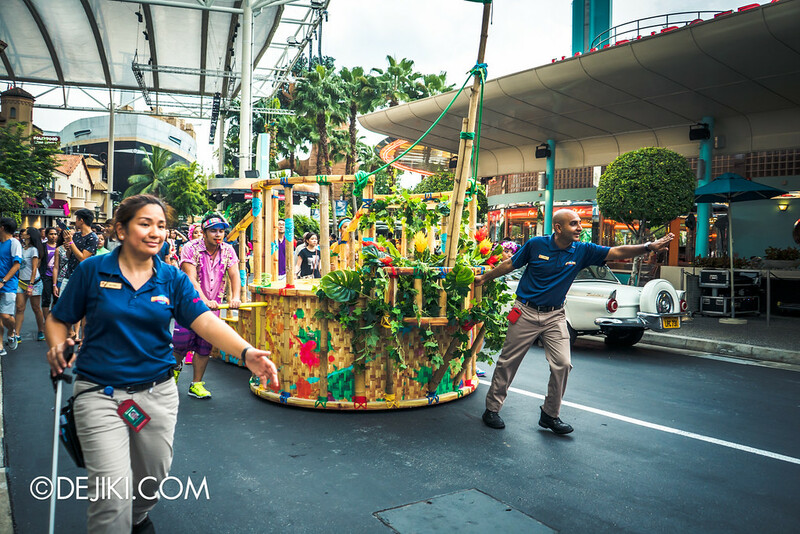 This is one of the two mini ‘Soak Out Crew’ floats that make their way across the park zones to the Soak Out Lagoon Stage, attracting guests along the way to Hollywood. But if you want to catch the show, you should already be at Hollywood at the start! 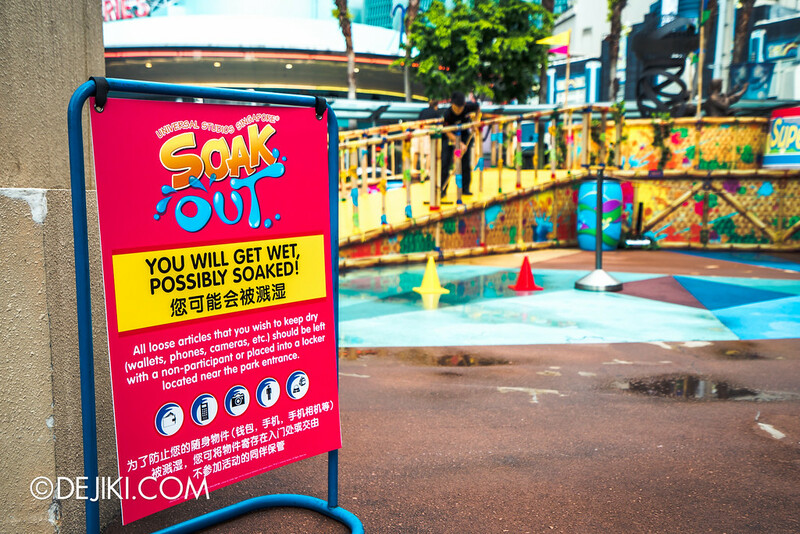 WARNING: You may get wet at Soak Out Water Party! There are two zones for Soak Out. 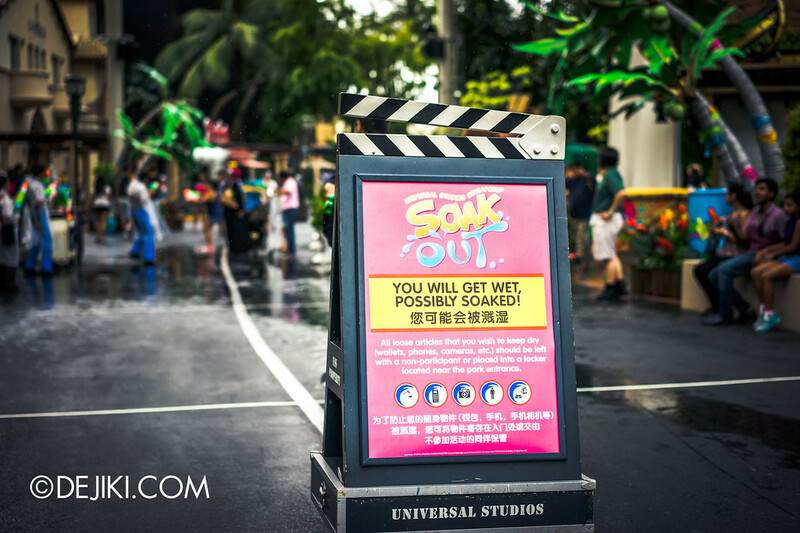 Of course you will get wet if you stand all the way in front, but Soak Out’s stage doesn’t just fill up the usual space at Hollywood. If you are standing here in Hollywood, you are in the safe zone. Anywhere else close to the stage: you might want to get some ponchos or waterproof bags/case for your electronics. 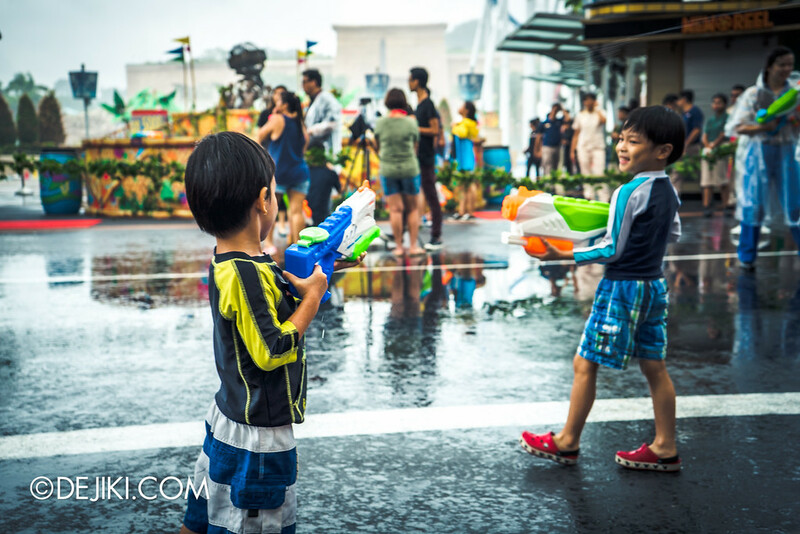 Remember that Universal Studios Singapore has a fountain? 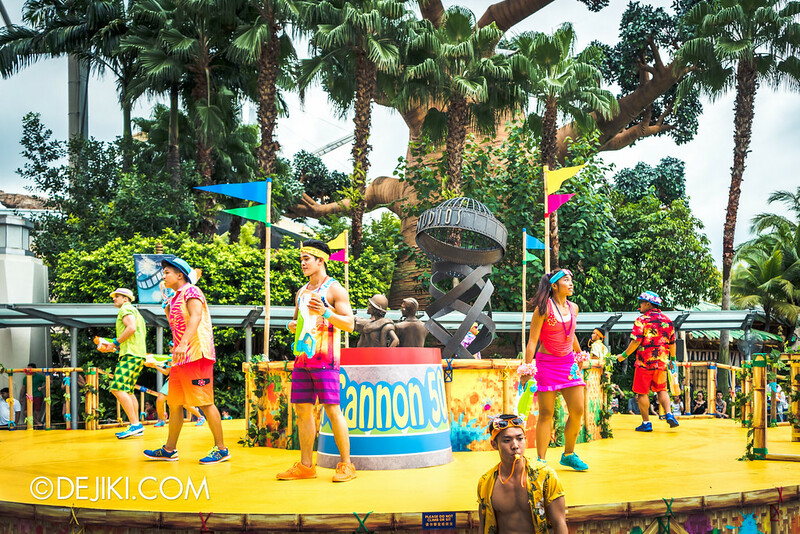 Well, the stage extends towards the lagoon and is built around the fountain. 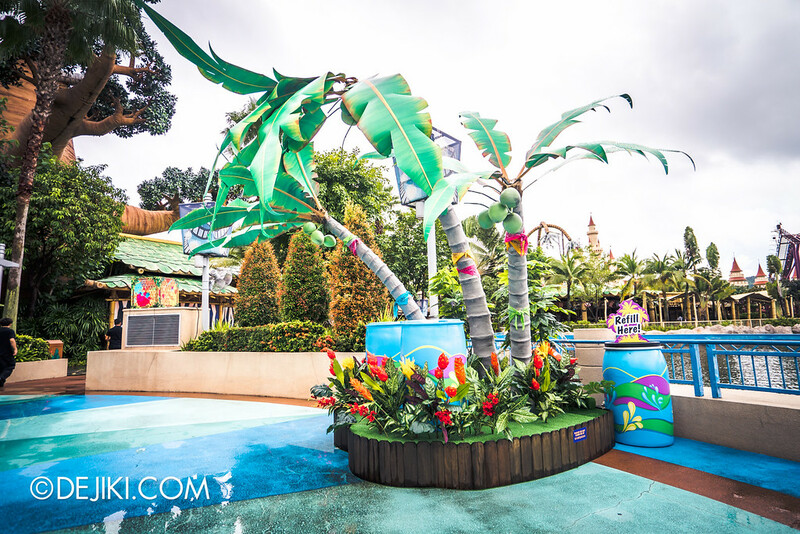 So the space on the side of Soak Out’s back area is also a soak zone, though depending on your luck it might not be as wet as being at the front. The cannons are used at the very end. 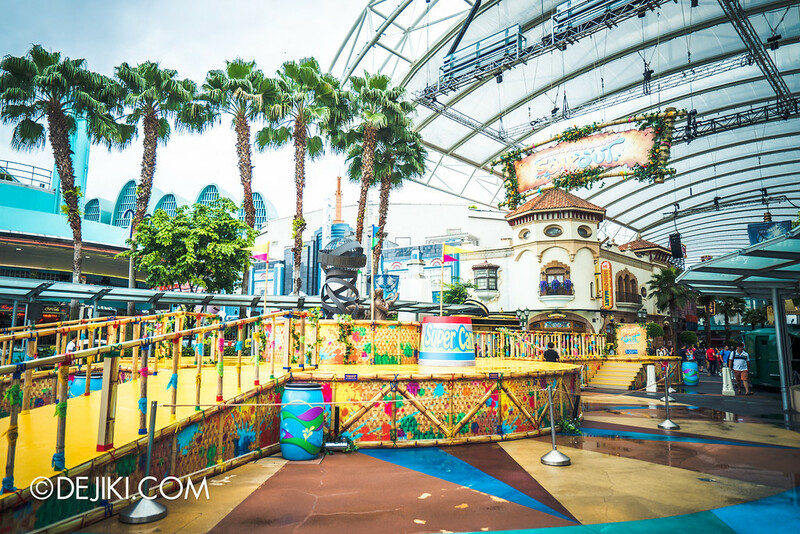 Right at the back is an open play area, so be prepared to get shot by Super Soakers here. 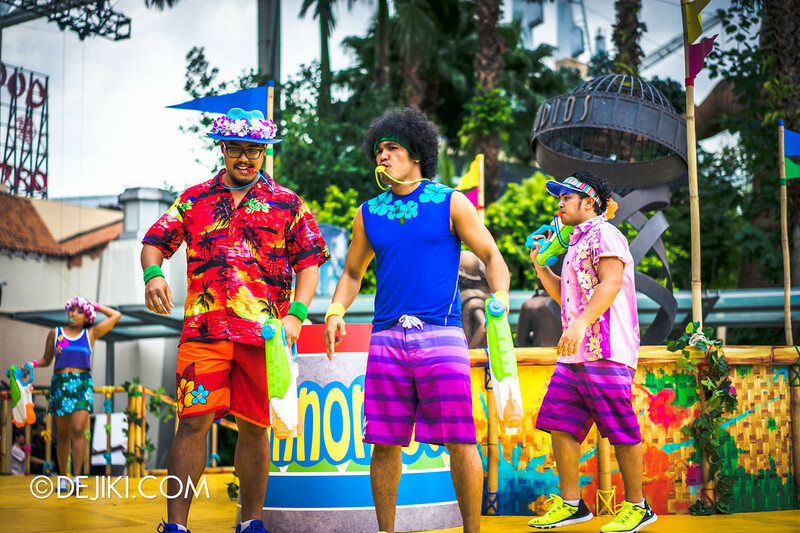 Oh, the park allows guests to play with water guns within the boundaries of the Lagoon Stage in the Hollywood zone. 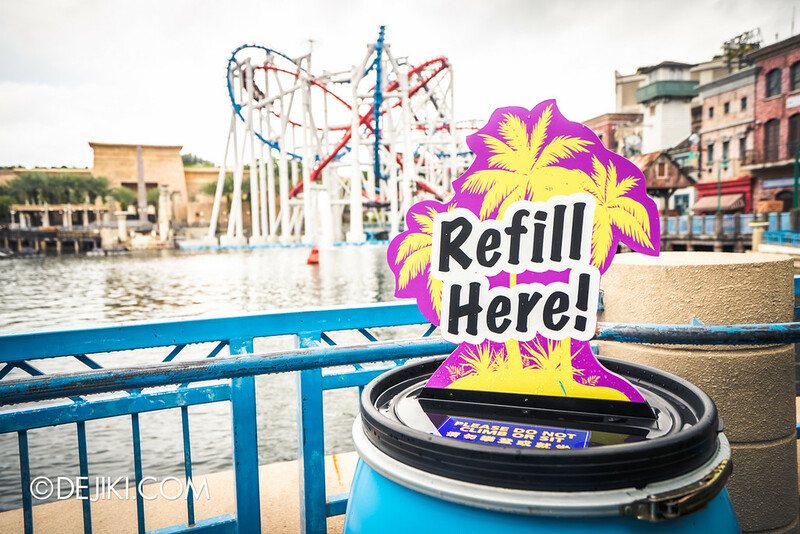 This is extended for about 30 minutes after the end of each Soak Out Water Party. 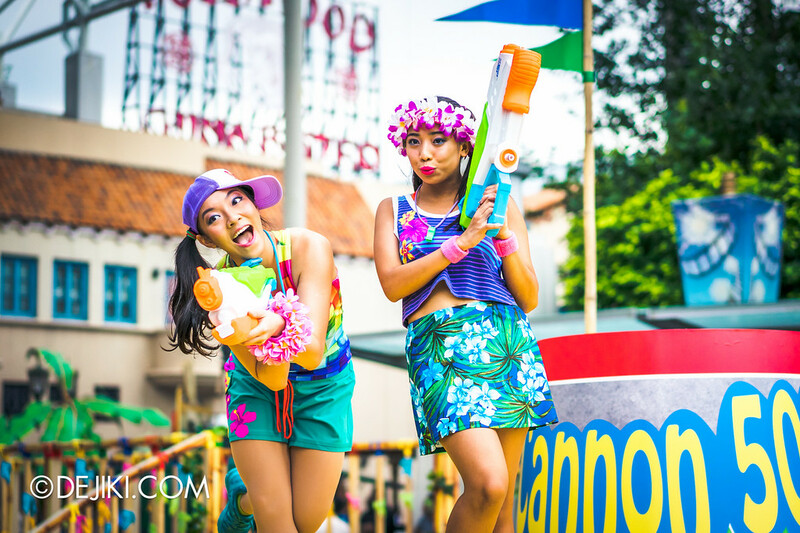 Outside of Soak Out, guests are not allowed to use their water guns anywhere else at the park. 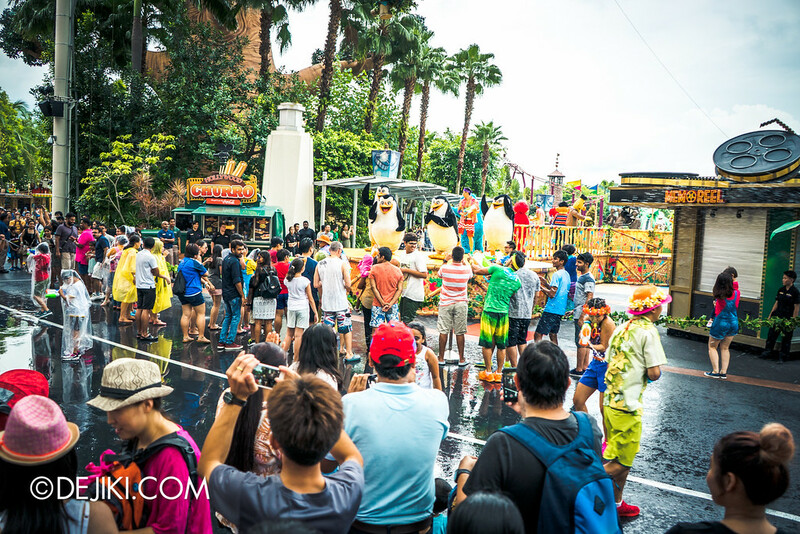 For guests that want to stay dry and avoid the Soak Out experience altogether, do note that the inner path surrounding the park’s lagoon will be partially blocked by guests in the soak zone, while congestion is expected at Hollywood Boulevard due to the Lagoon Stage’s front section (and that soak zone). 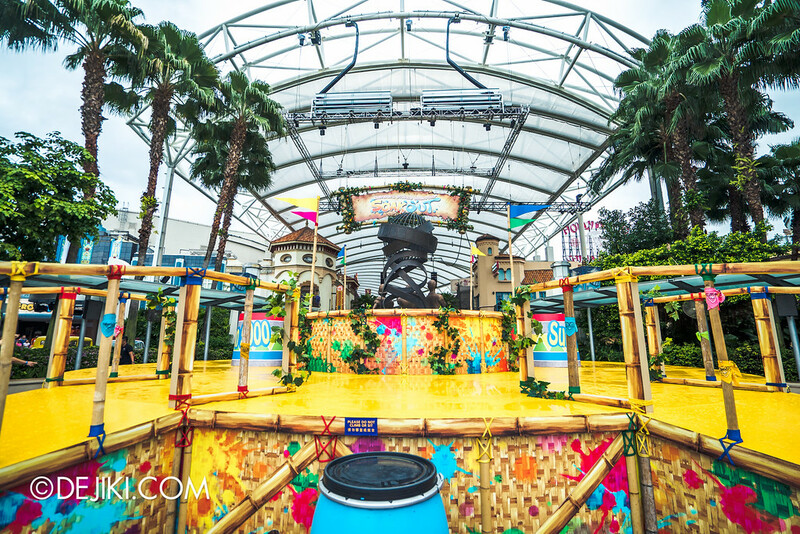 As the stage is not completely covered, Soak Out Water Party may be cancelled in the event of inclement weather. 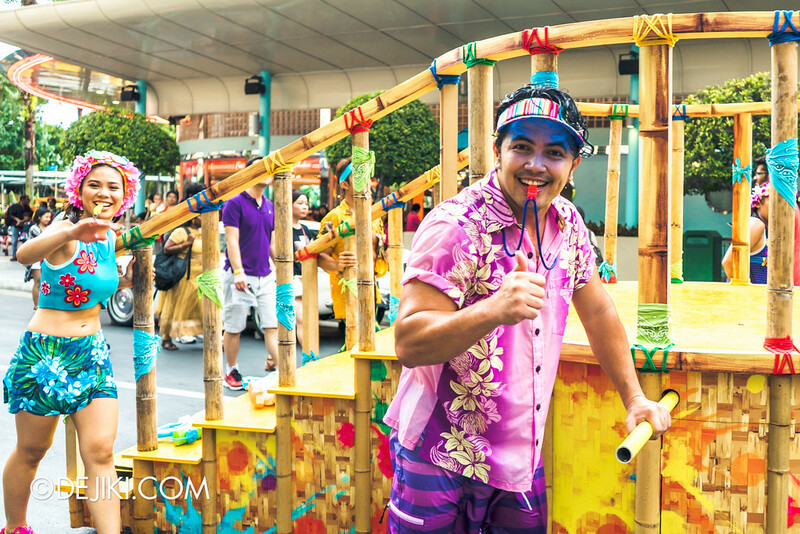 Water Play may still be permitted at the park during the show timeslot. 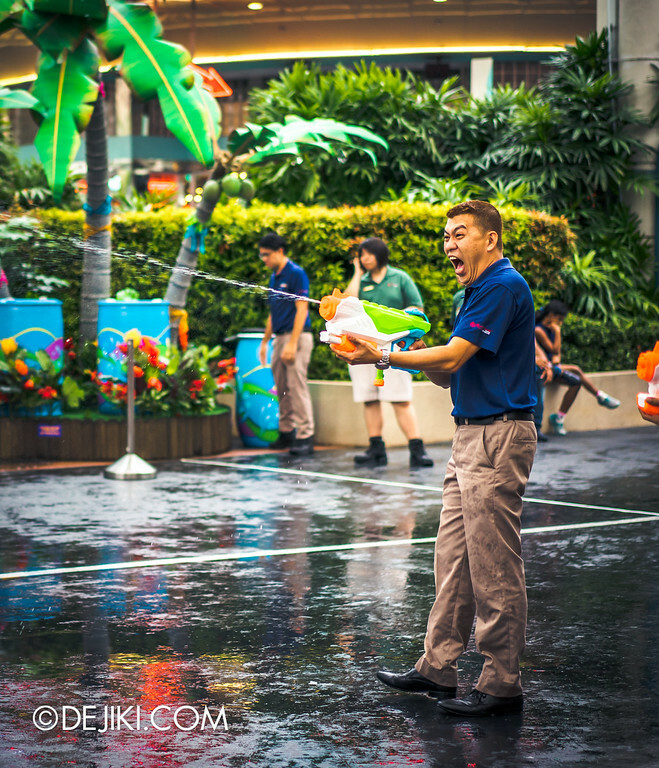 You can engage in friendly water fights with the park’s crew! 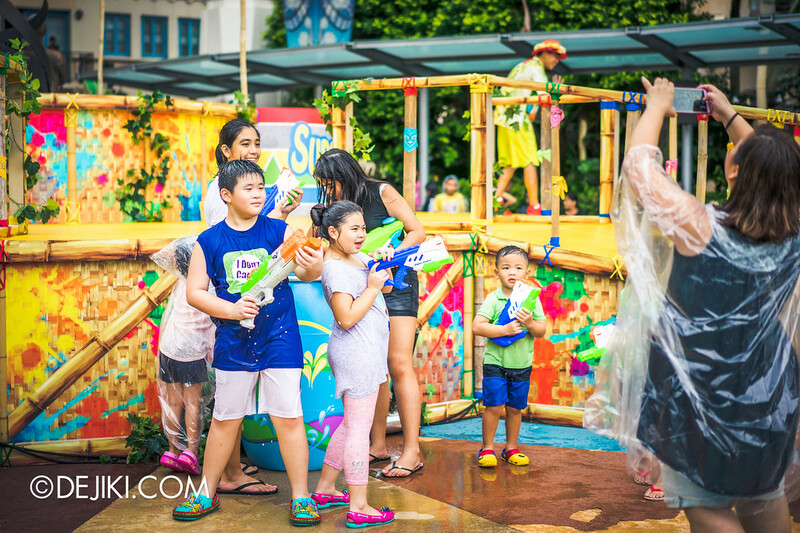 Grab your Nerf Super Soakers at the park, from S$19.90. 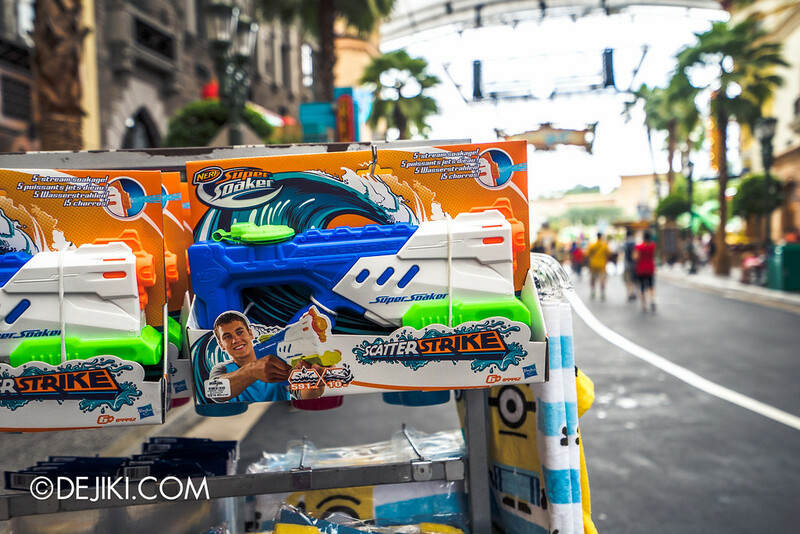 For safety reasons only specific models sold in the park are allowed for use during Soak Out, and they are: Scatterstrike and Floodfire Blaster. 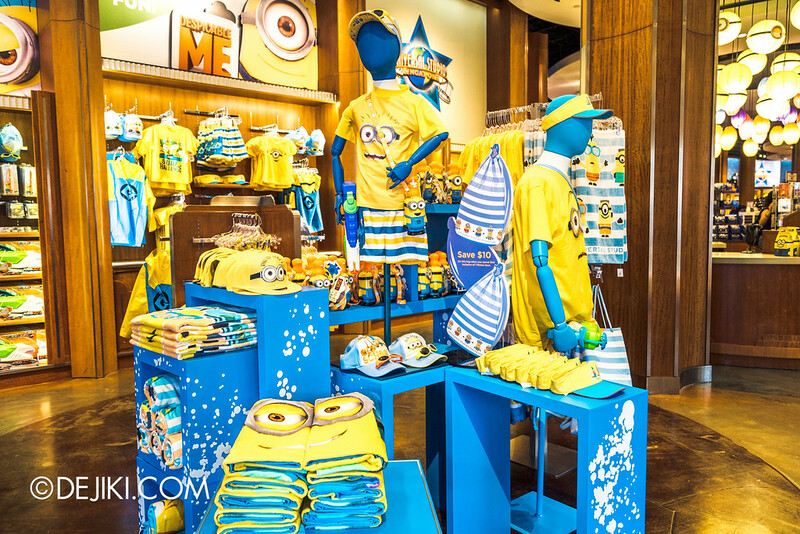 We’ve not seen the Minion Soaker Backpack in the park yet. This won’t be a wet event. Just chillout to the live band and enjoy projection effects at the New York Library. 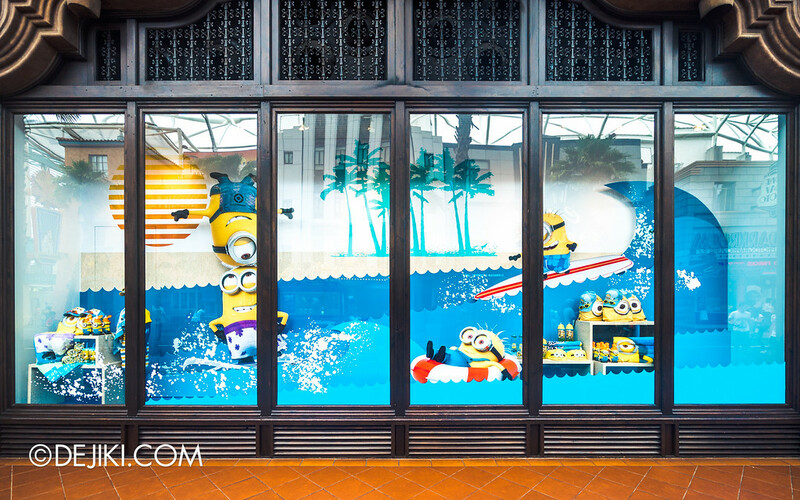 Oh, look – new store window! 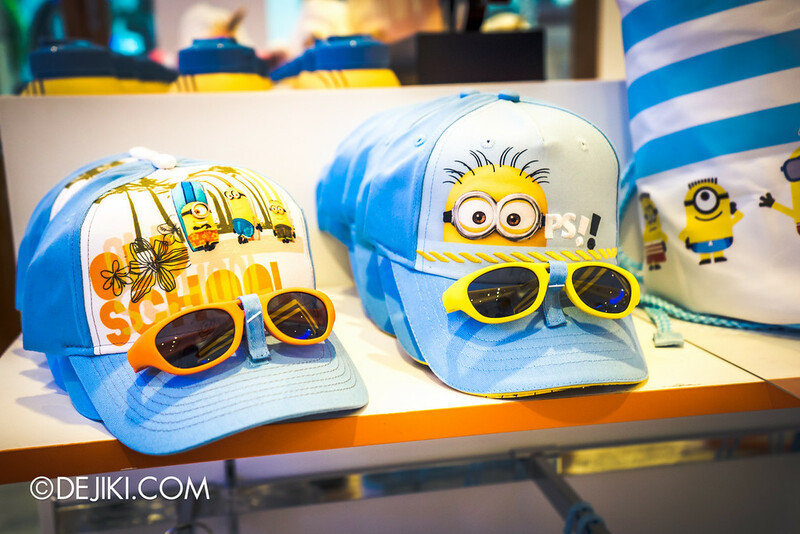 The ‘Summer Collection’ of Minion Merchandise is here. 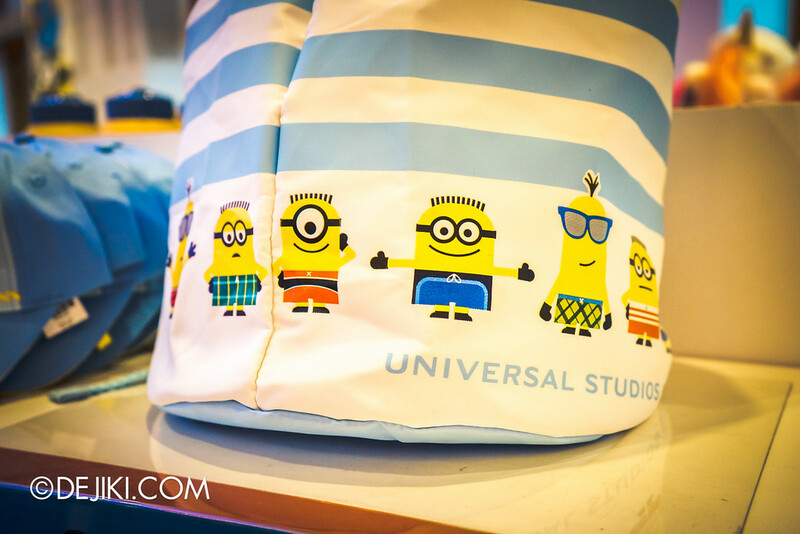 The current promotion: Spend $60 on Minion items to get a $10 discount on this drawstring bag. 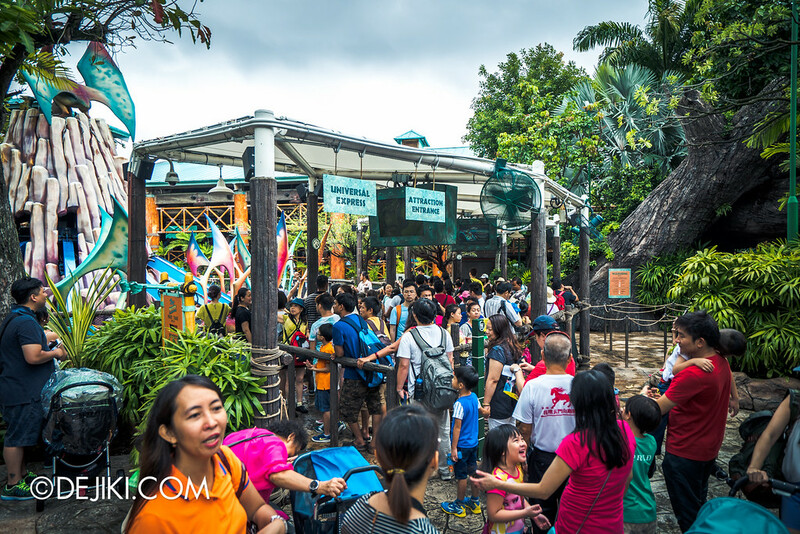 Despite the rainy season, the park’s outdoor rides are quite popular. 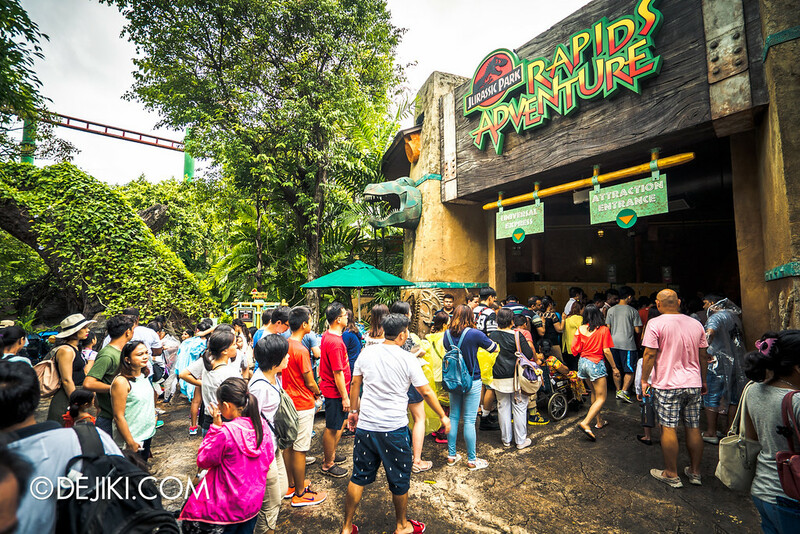 Jurassic Park Rapids Adventure had long wait times and most of its queue being used on a weekday. The queue overflowed outside. 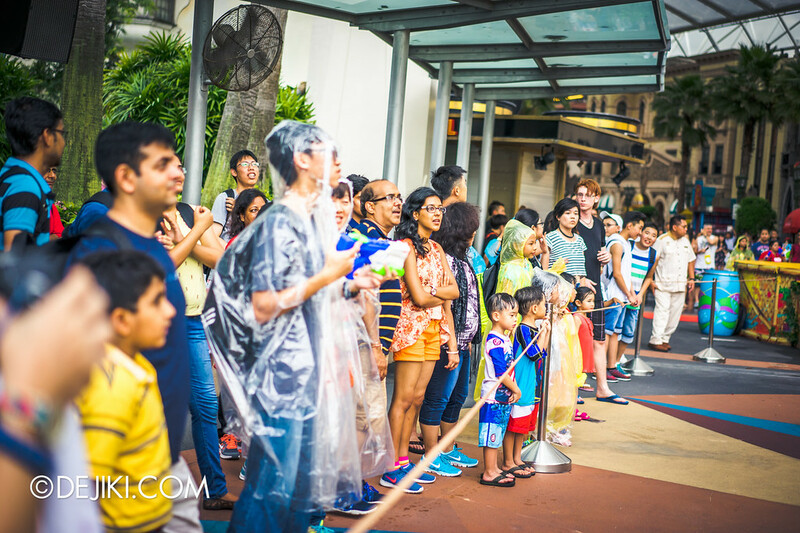 Even the line for Dino-Soarin’ overflowed. Construction for Halloween Horror Nights 6 (HHN6) has started, with tents being set up in back-of-house areas in the park. One of the tents is definitely a haunted house (Hell House, MATI CAMP, Songs of Death). The other is being built at the temporary queue area used in the past 2 years. Whether that is for another house, or a much-needed sheltered queue area, remains a mystery for now. 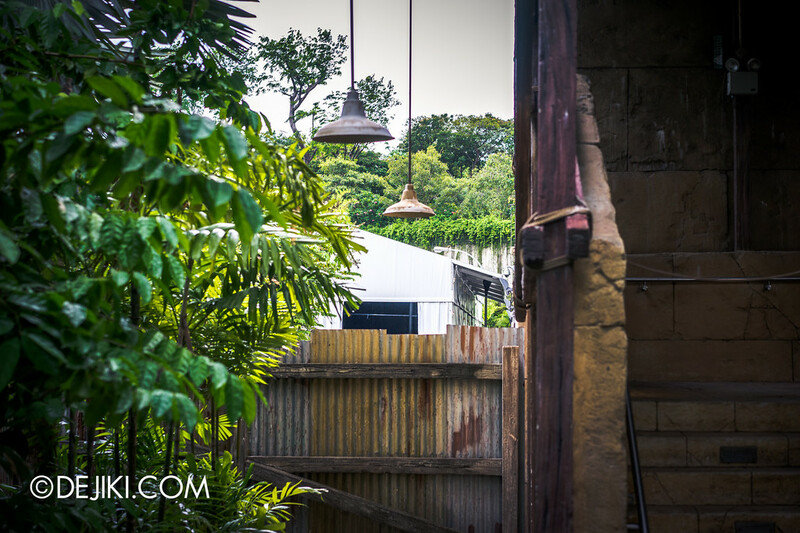 According to park regular Tong Ming, another tent is set up on the other side of Revenge of the Mummy’s show building. HHN6 will start on 30 Sept 2016 (Friday) and end on 31st Oct 2016 (Monday). While the park has yet to publicly announce this year’s event nights, we’ve heard that there’ll be around 15-16 nights scattered across weekends as usual. However, this year there will be less nights on Sunday, as event nights are scheduled on Thursdays instead. 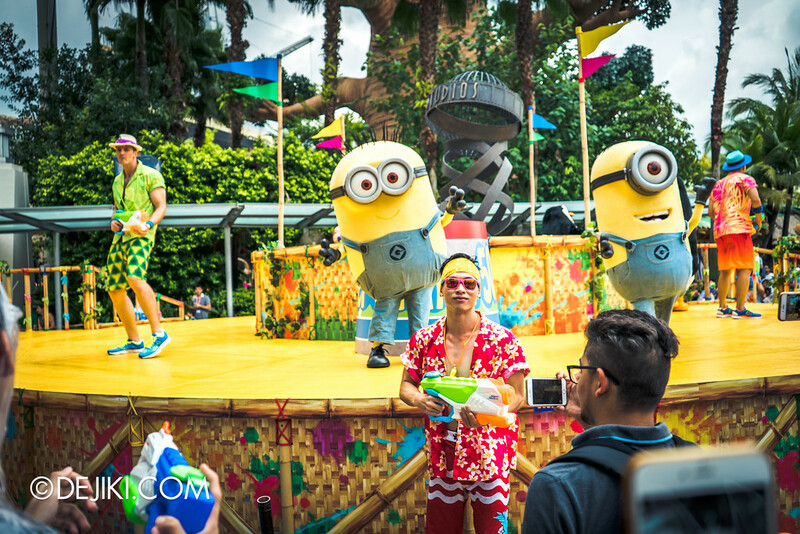 So… will you be heading to the park for Soak Out Water Party? I think there is still a small pad of land behind the Library, Rockefeller facade where they used for HHN queues. Was thinking that if Fantastic Beasts were to do well then this area could be part of the new Potter Verse featuring Newt Scamander – after all the events did take place in New York albeit in the 1920s. 1 of the cyclon trains seem to be missing in action since last month. It doesn’t seem to be at the servicing area as well. Guessing if there’s a possibility of them modifying it to a “backwards” version for Halloween?